Today the family, friend, and I hit the 9th annual Pagan Pride Festival and we had a blast. I am a Christian, born and raised, and I still hold those beliefs. I will say that we had a ton of fun though and plan to go back next year. My son collects rocks, and they had a large selection of stones, rocks, and crystals for him to choose from. My husband, brother, and son like sharp things, so they purchased assorted knives. My daughter is a fairy freak, so she got a tiny pewter fairy statue and a star shaped jar of pixie dust. I got myself a Pagan Pride tank top and have a beautiful new paper towel holder made by a local blacksmith. Needless to say the artisans, vendors, and local shops represented were amazing! They had food trucks there that had an amazing selection and I had myself an early dinner. We waited till Sunday to go because I wanted to see Tuatha Dea perform and was not disappointed. They had a wide selection of songs, from Irish choices to Rhiannon, a personal favorite. We’re definitely planning to go back next year! I do want to add that these are happy people. No one was rude, or snide. There was no judgement for anyone, no matter who they were there with, what they were wearing, or how they looked in general. Don’t be quick to judge someone based on their beliefs. Not every pagan is a satanist, not every Christian is judgmental, and everyone deserves to be weighed (not judged) by their own merits. 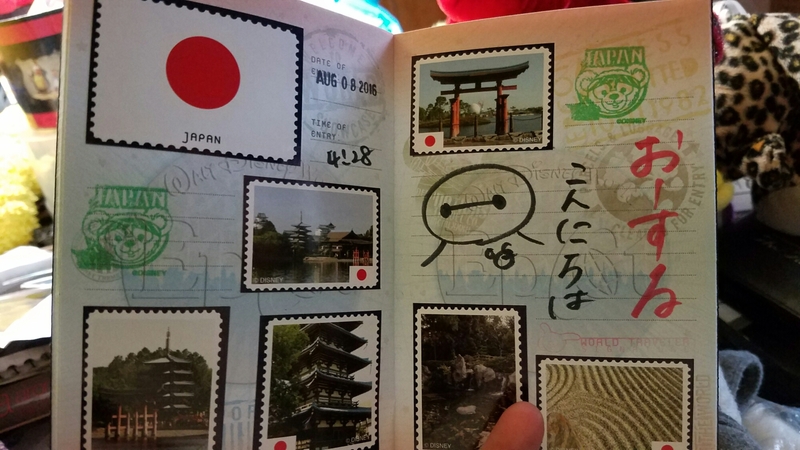 Our Disney trip was last summer and I still haven’t covered it all yet! Slacking off here! 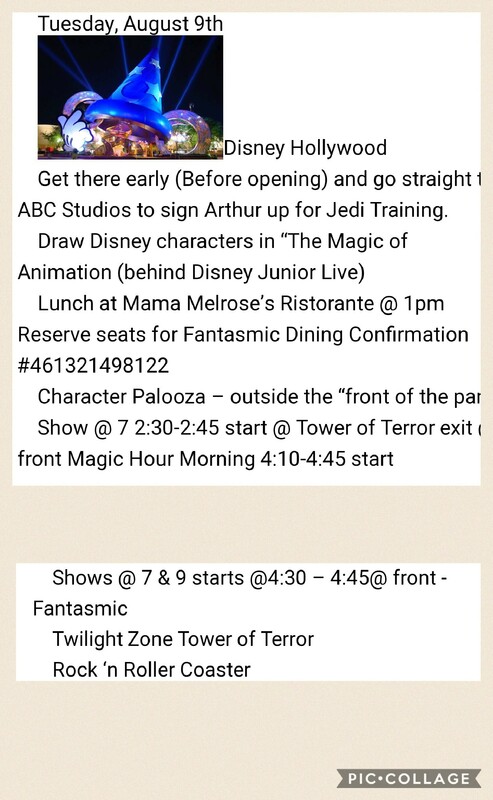 Above is the planned itinerary for our day at Disney Hollywood. Of course it is just a plan, so things change, but the plan sure helped us get the most out of it! The day started off early for Arthur and I. 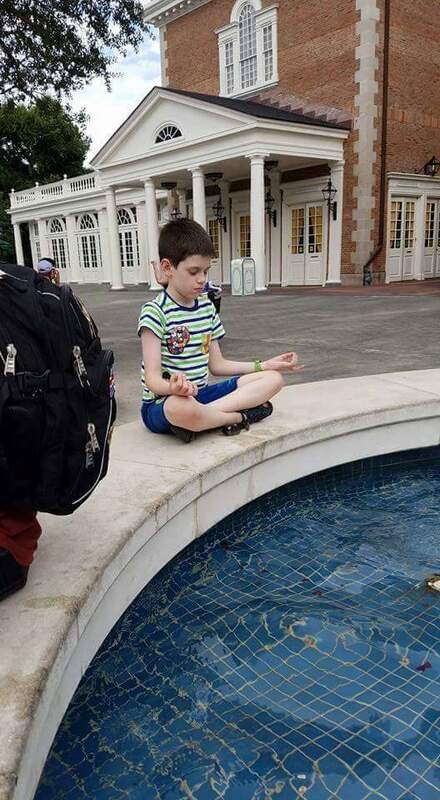 We got up and caught the bus from the campground to Disney Hollywood to be there before the park opened. I wanted to be sure Arthur was able to attend Jedi training! Once the doors opened, we quickly made our way over to Indiana Jones stunt show area and got Arthur signed up. Then we had a little time to kill before everyone else arrived. I’m in the process of raising geeks, so Arthur made our way to the Star Wars side of Disney Hollywood. We had a lot of fun meeting some characters and checking out the amazing displays they had set up. It was really nice to get in early. We were in and out of character meet and greets in no time. 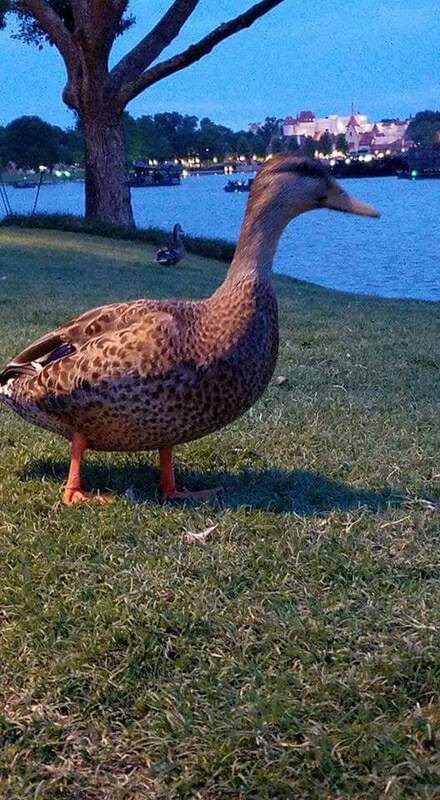 We made our way back to the park entrance to meet the rest of our party. Then it was a little bit of wandering in and out if buildings to avoid the sprinkling rain. 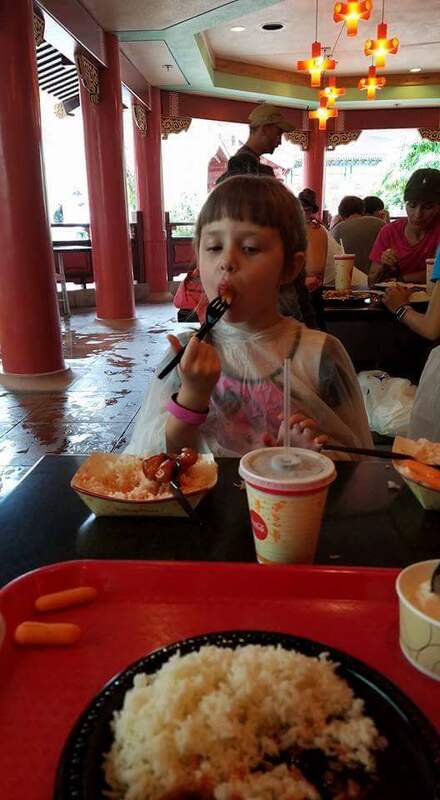 The rain was a little nerve racking because it could cancel out Arthur’s Jedi training, so we were constantly checking the weather reports. Thankfully we were good to go! Jedi training is amazing! During signups, they give you a time to come back, when you arrive, they give the kids a Jedi cloak and have them march to the stage. Once there, the kids are given lightsabers and taken through a series of moves as a group. It is a bit of a show too, with the teachers interacting initially with Darth Vader, the Seventh Sister Inquisiter, and Kylo Ren briefly. Then the kids are given the opportunity to face either Darth Vader or the Inquisitor individually. Big tip for this one: make sure your kid goes to the bathroom prior to this show as they hydrate them before going on stage! We used our fast pass for this park to see the Indiana Jones Stunt Show. This was amazing! It was stuntmen and women reenacting scenes from Raiders of the Lost Ark. Rolling boulders, flaming airplanes, whip work and people flying through the air! The kids and adults in our party were awed through the whole show. There is also some audience interaction when they pull some of the audience members on stage to be bystanders during some of the stunts. Definitely a show worth seeing! 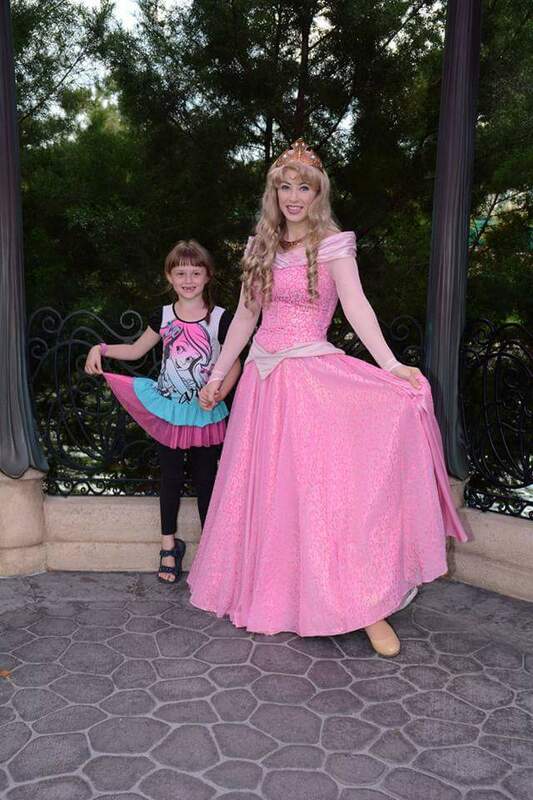 Chiara had another fun princess interaction, just like at Epcot, when she got to walk away with Sophia the First. 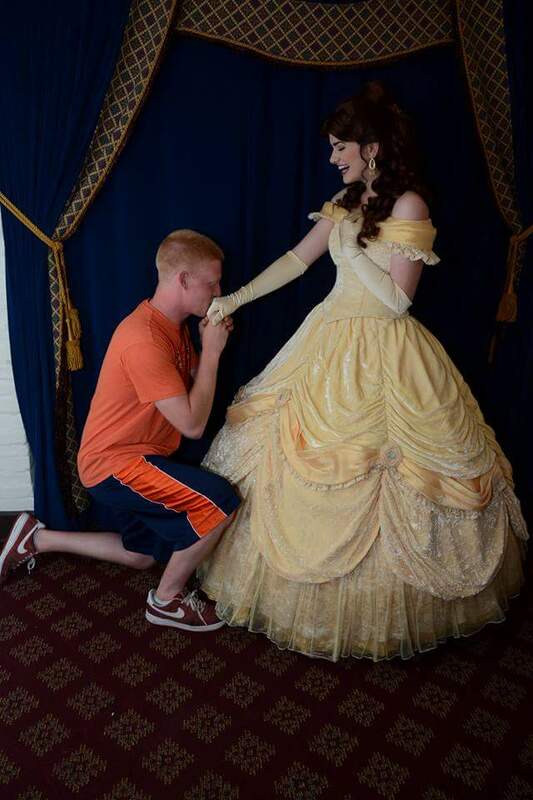 She was the last one in line before the princess’ break, so Sophia took her hand and walked away. Our lunch was at Mama Melrose’s Ristorante. Delicious option for a meal, but truthfully this was probably a little too heavy for lunch. Especially if you will be walking around more in the summer heat of Florida. Large portions, friendly staff, delicious food! 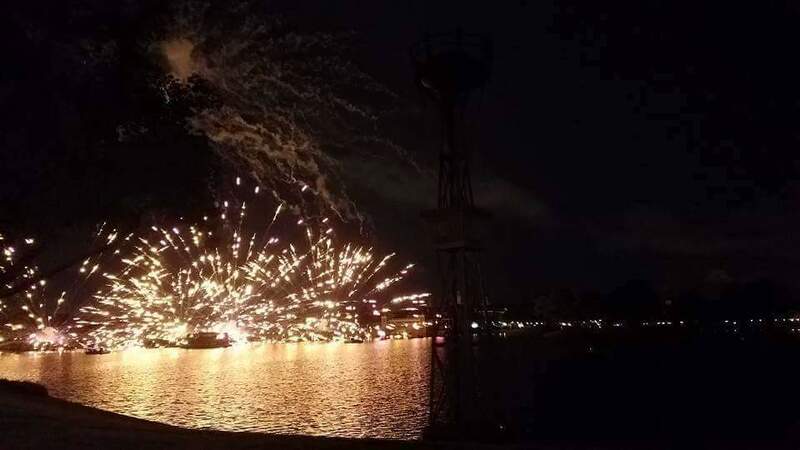 There is the added benefit of getting to reserve your seats for Fantasmic, the amazing Disney Hollywood show. We ended up missing the show because everyone was wiped, but mom and I had seen it on another visit, and the show is amazing! Other highlights from the day included the kids, and my almost 30 year old brother, making their own lightsabers. Arthur made his to look like Kylo Ren’s, Chiara made herself a purple one to match my Mace Windu one. Josh, my brother, made himself a green one. We also rode Star Tours several times! This is an amazing ride that starts off as a tour through the galaxy, but you go astray, end up in a battle, facing Kylo Ren, and finally making it safely back to the start. Arthur, my sweet little Star Wars geek, loved this ride a lot! We may not have followed our itinerary very closely, but we still had a blast. That is the most important part of vacation after all! It’s been months since we were in Florida, but I still remember how much fun we had! Then I looked and realized I never fully blogged about our trip. Bad Stevie! 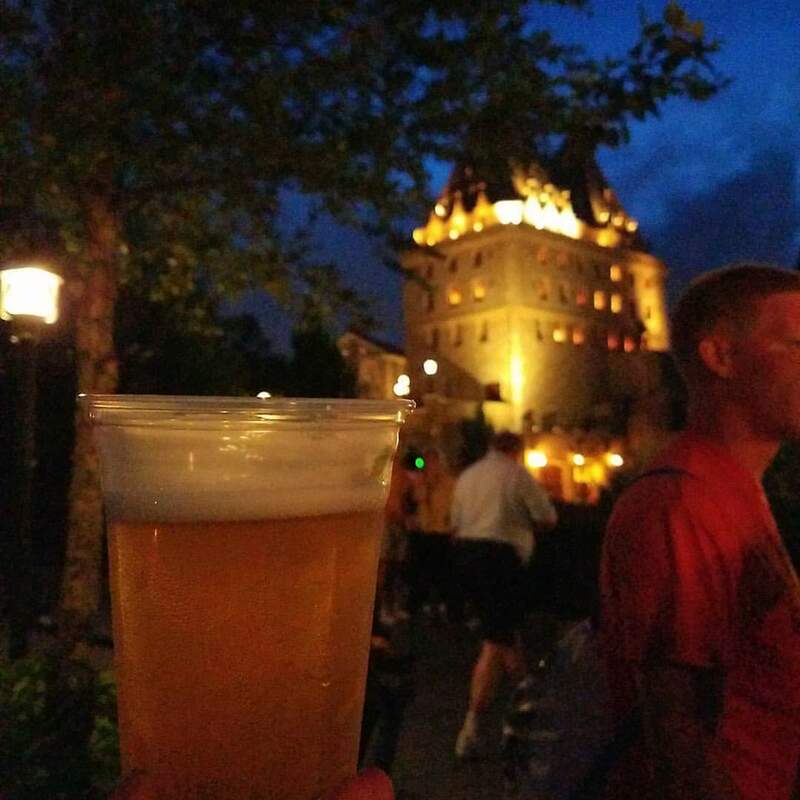 I did briefly talk about Epcot, and how we drank our way around the world. There is so much more that we did that day!This trip to Disney started with a lot of planning. 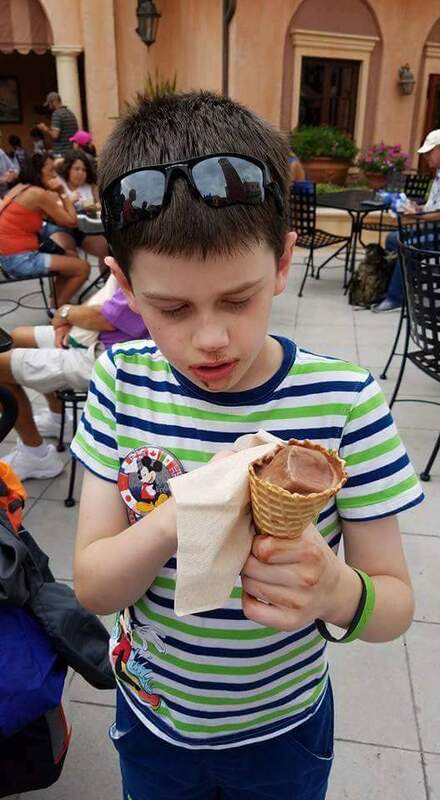 Our first Disney trip, Epcot was a half day, boring stop. After hitting Pinterest, I came up with the following itinerary. Mine was handwritten, then my mom did her thing to make it pretty. I usually try not to start days like this in the gift shop, but we needed to so we could buy the kids passports. The passports come with stickers, featuring the flag and different sites from that country. 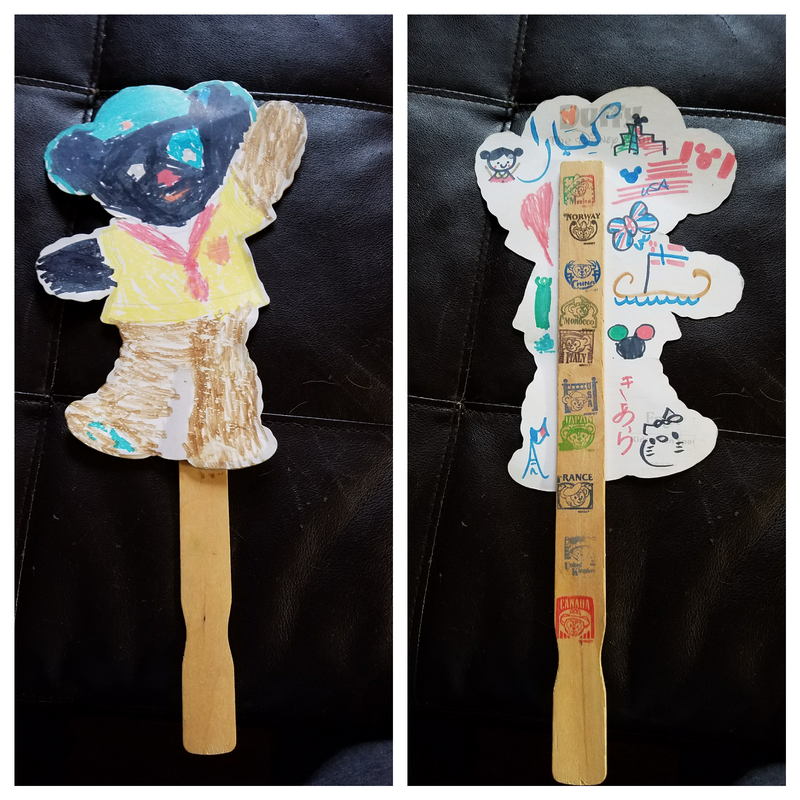 As you go around the world showcase, you stop at each KidCot station and someone will write a little note in the native language. If you don’t want to get the passport, you can pick up a Duffy fan for free at any station. 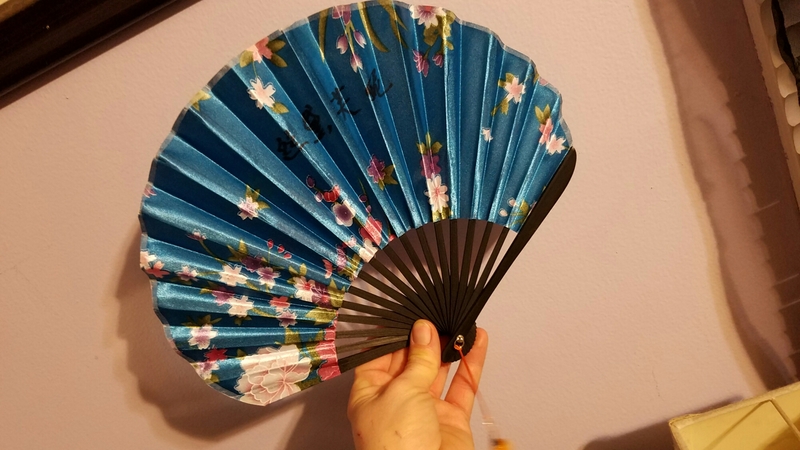 Chiara wanted the fan, as well as her passport, mainly so she could color it! NORWAY: Norway included a visit with Anna and Elsa, easily the most beautiful Elsa I’ve ever seen. 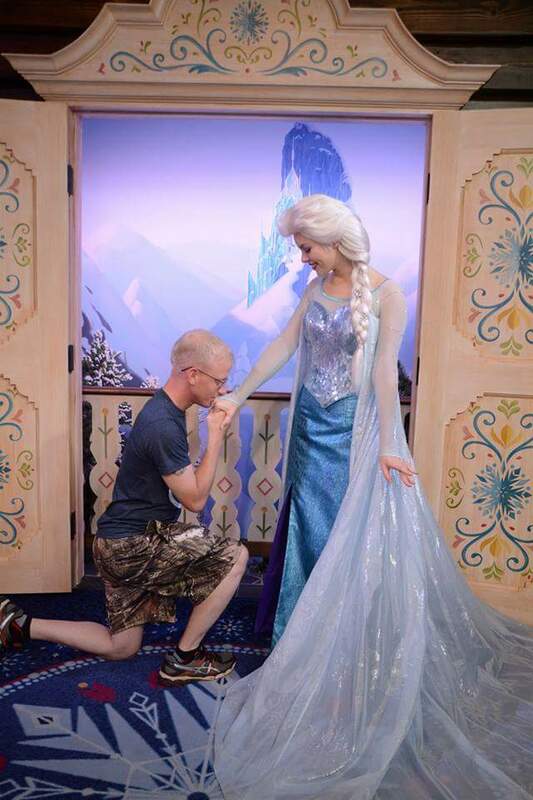 My brother was enchanted. 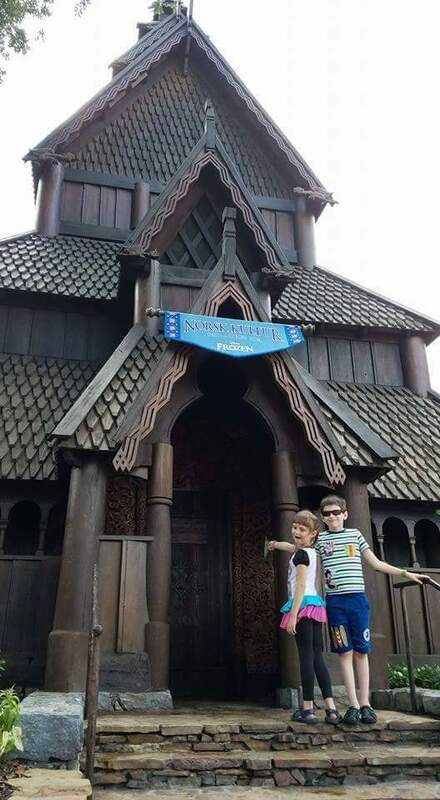 We also rode the ride Frozen Ever After, it’s a really fun log ride! KidCot station, drink and moving on! 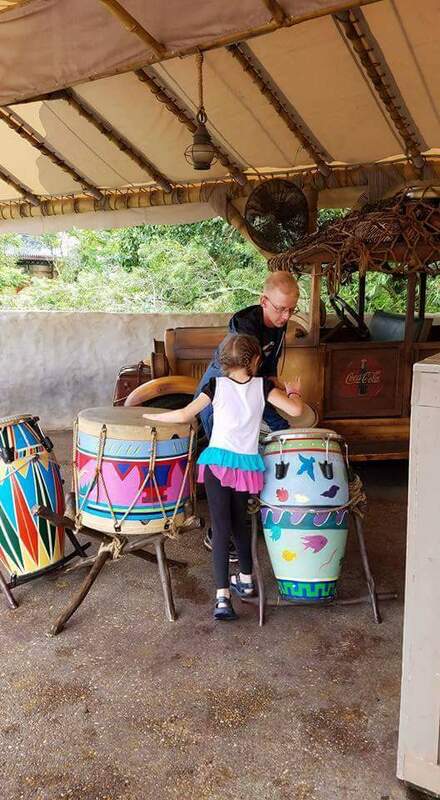 AFRICAN TRADING POST: There was no KidCot station here, but Chiara had a lot of fun playing the drums while the grownups enjoyed their drinks. It’s vacation and we’re outside, play on! GERMANY: I was really looking forward to Germany because I read about a shop called Karamel-Küche. 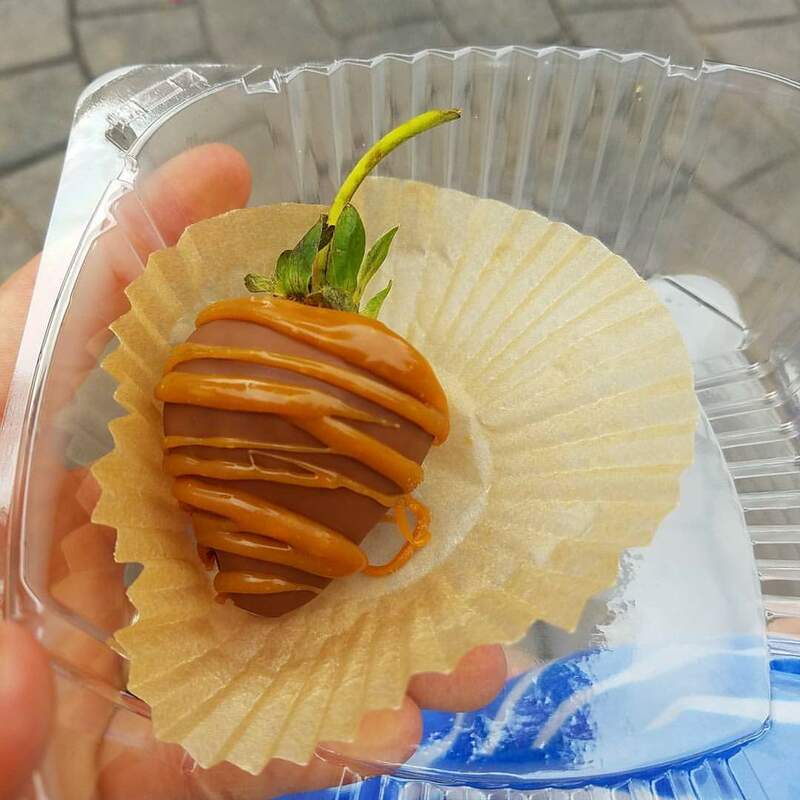 I think it is really expensive, even for Disney, since this delicious strawberry cost $5 alone! Tony was really excited to find liqueur chocolates at another stand too. KidCot, drink, and moving on! ITALY: Italy is a personal favorite, after all, I married an Italian! The kids enjoyed gelato while the adults had their drinks. Quick stop at the KidCot station before moving on. 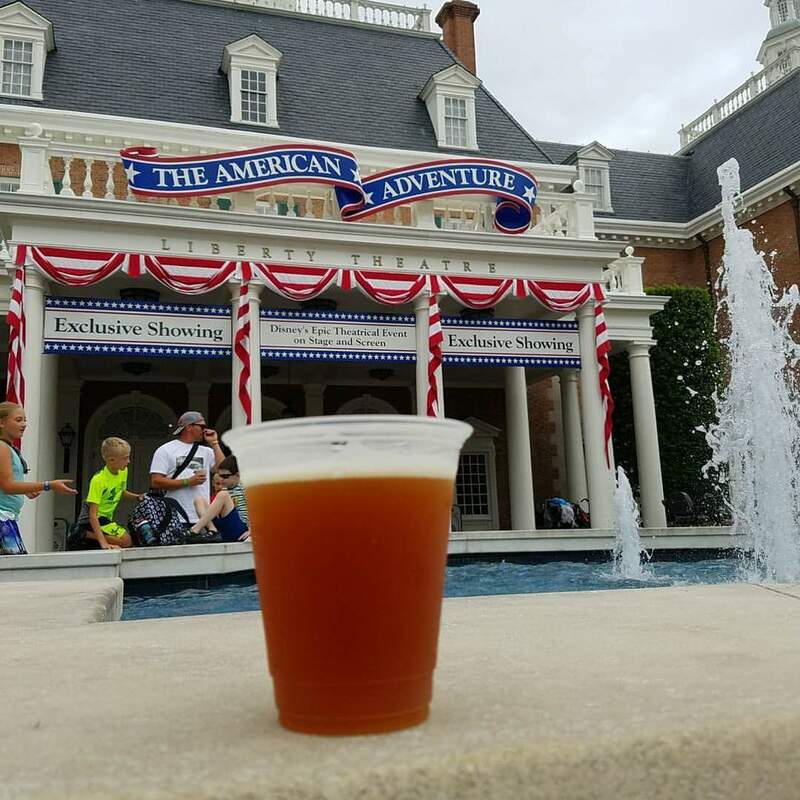 THE AMERICAN ADVENTURE: This was a time of catch our breath and let the adults recover from the drinking. Arthur enjoyed copying Uncle Josh’s meditative rest. Then it was KidCot, an American beer and onward! JAPAN: Chiara really enjoyed Japan! 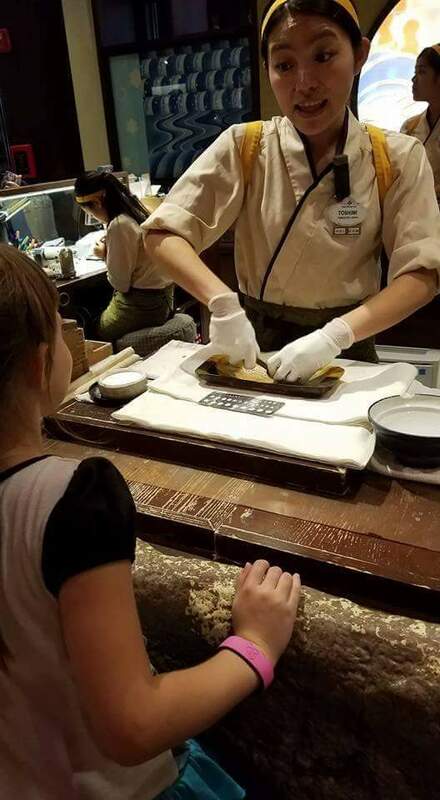 When traveling through, we stopped at Mitsukoshi. Here, you get to pick out an oyster and keep the pearl found inside. Chiara got a very pretty silver colored pearl and she chose a small glass bottle I think purple sand or hold it. They have many settings available for your pearl, including Cinderella’s carriage! KidCot, alcohol, then moving on. 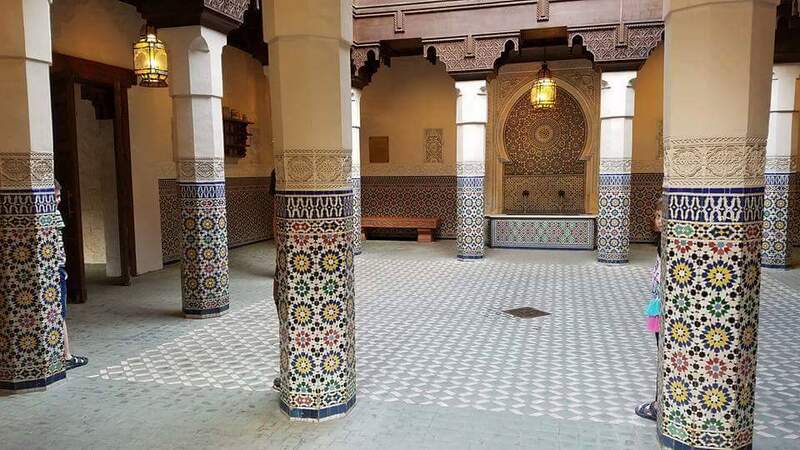 MOROCCO: Sadly we missed the meet and greet with Aladdin and Jasmine, but we enjoyed the mosaic work here. KidCot was fun, I especially enjoyed learning the words they featured. Drinks and then onward. 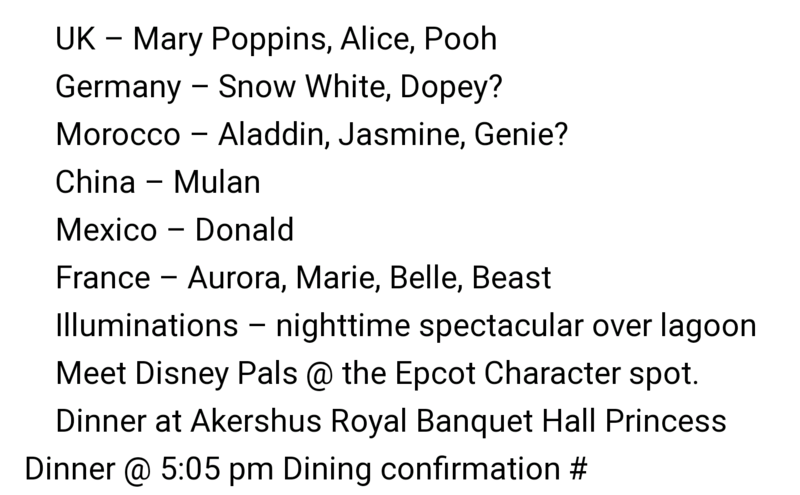 ***We backtracked to Norway at this point for dinner at Akershus Royal Banquet Hall for our princess dinner. This was another big treat for Chiara because we met Belle at the door and during dinner, four different princesses came to our table. FRANCE: Walling to France after dinner (that’s fun to say), Chiara saw Aurora, then the Princess took her hand and led her right to the front of the meet and greet line. Chiara was in heaven! I always love seeing he mini Eiffle Tower in France! The fountains and architecture here are very beautiful as well. My brother treated us to mini eclairs while here and they were delicious. KidCot, alcohol and continue on. UNITED KINGDOM: Those of us that were drinking hit the Rose and Crown Pub for our beverages and the pub itself was beautiful. Exactly what I think a pub would look like in England! 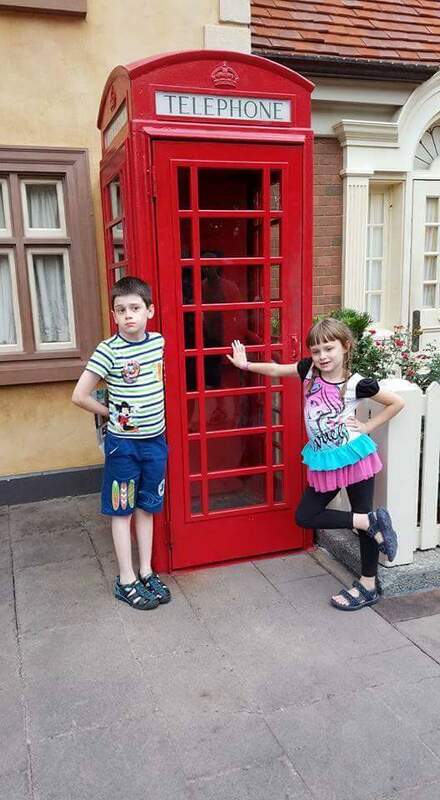 The kids enjoyed playing in the phone booth before we hit the KidCot station and then we were off of our last country. CANADA: Canada wasn’t super thrilling, mainly because we lived near Canada for so long. 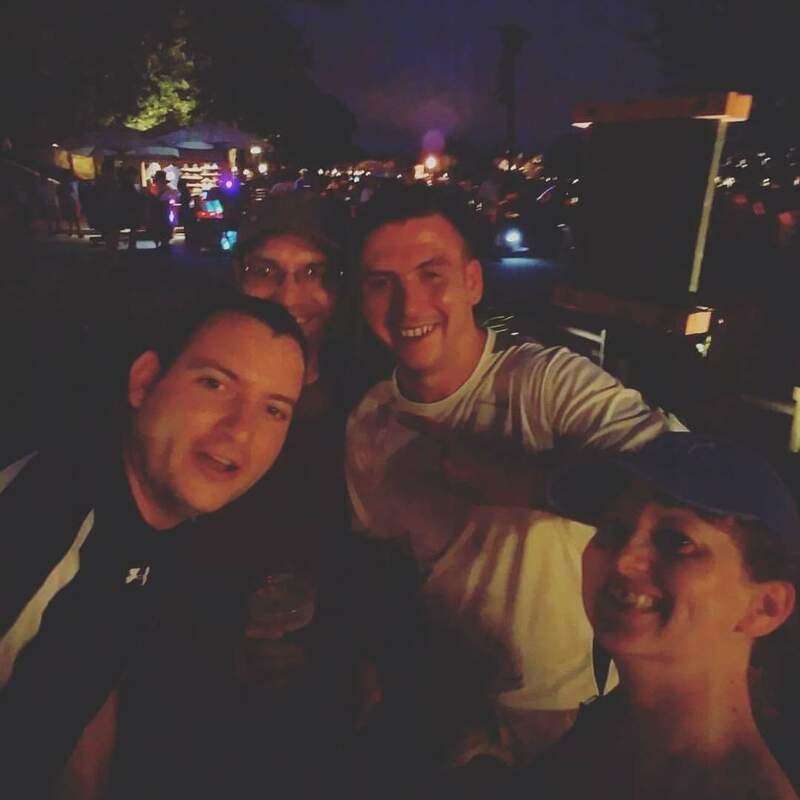 We did however meet some really fun French guys, who worked at Epcot, and had a nice long talk with them before the light show began. KidCot, a beer before last call, then off to find our place for the Illuminations show. The light show was fabulous! The giant globe on the water moves around, lasers shooting through the air, fireworks, music and projection images on spraying water. Definitely worth staying late for the show! It was such an amazing day! 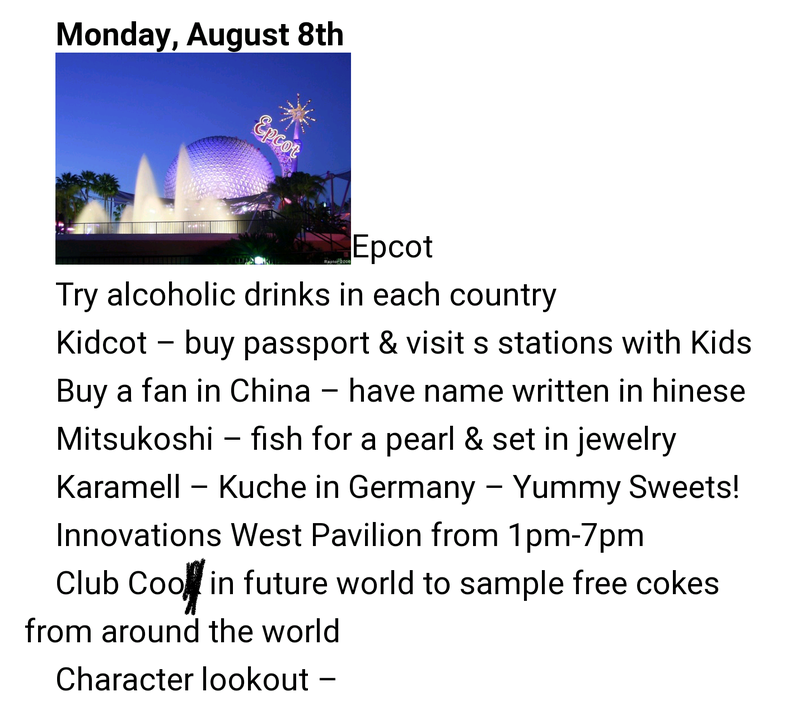 With a little planning Epcot can be so much until, so take a little time, make your own itinerary and enjoy! Jenna may have thought I was kidding about doing this, but nope! It’s happening! I love driving places. Flying can be nice, and sometimes required for certain destinations, but driving is my preferred method of travel. I love seeing everything along the way. You never know if you’ll be passing the world’s biggest wind chime, or some other ridiculous thing! This October, I had the opportunity to go to a Rhode Island wedding with my friend Jenna. I’d never been before and was definitely looking forward to it! I convinced Jenna that driving was better and cheaper than flying, so off we went. Along the way we saw many beautiful bridges. It’s a crazy thing to get excited about it, but I loved it. 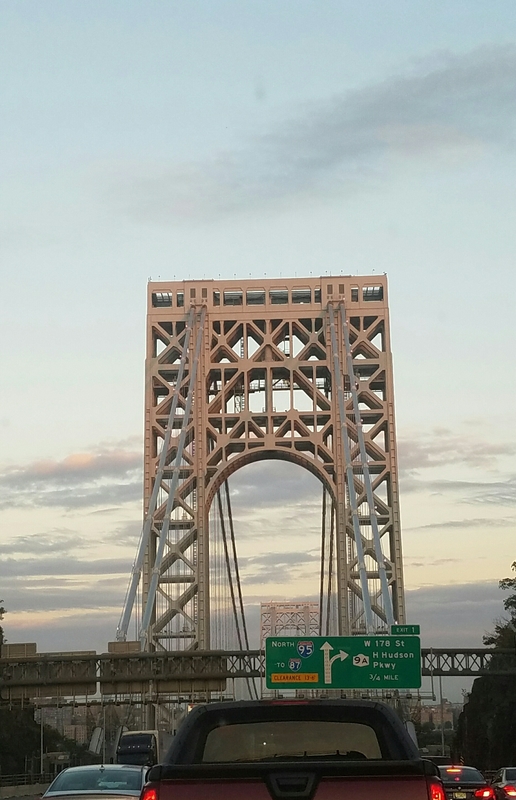 This beauty is the George Washington bridge in NYC. It is a pricey one, as the toll to cross was $15. It makes one wonder how people afford to cross it twice a day! 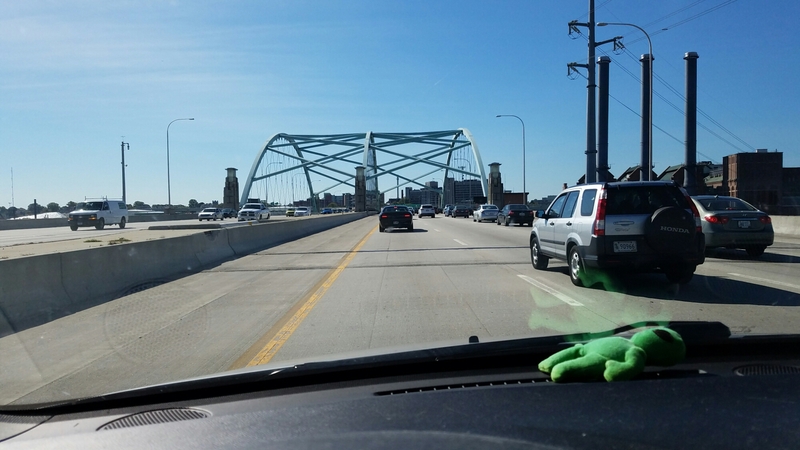 We got to enjoy it for a while as we were in rush hour. You have to take your fun where you can find it! This beautiful bridge was crossed in New Haven, CT. It’s amazing how different things can look when lit up at night. 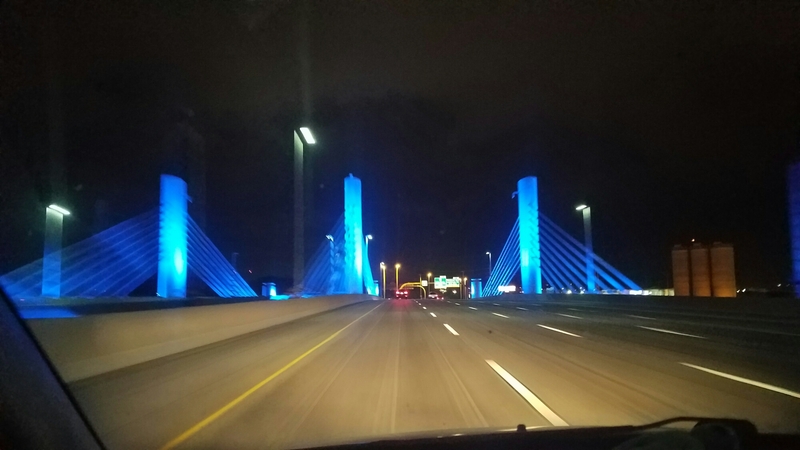 I’m sure this bridge is nothing special during the day, but the blue lights make it beautiful! 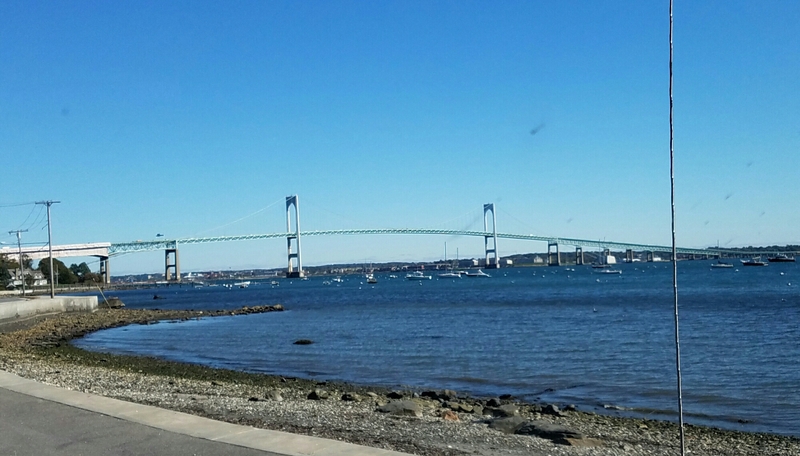 This giant bridge is found in Jamestown, RI and will cost $4 to cross. Very reasonable compared to the GWB! It takes you to an island of natural wonders, so it’s definitely worth it. I also especially love these tall bridges because the view from the high point is always amazing! This bridge is in Bristol, RI and absolutely free to cross. My favorite part about this bridge was the old fashioned light fixtures on it. They were beautiful! This more simple looking bridge is found in Providence, RI. 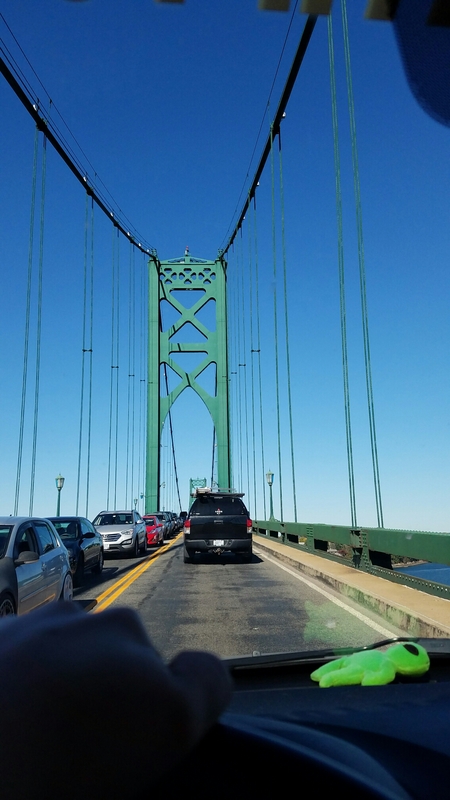 There is a lot of water in and around RI so there are many bridges! This industrial looking bridge can be found in Fall River, Massachusetts. As you can tell we were treated to many different styles of bridges on our trip, but we definitely enjoyed the view, both of them and from them! As stated in my last blog, we spent the last full week in Orlando. 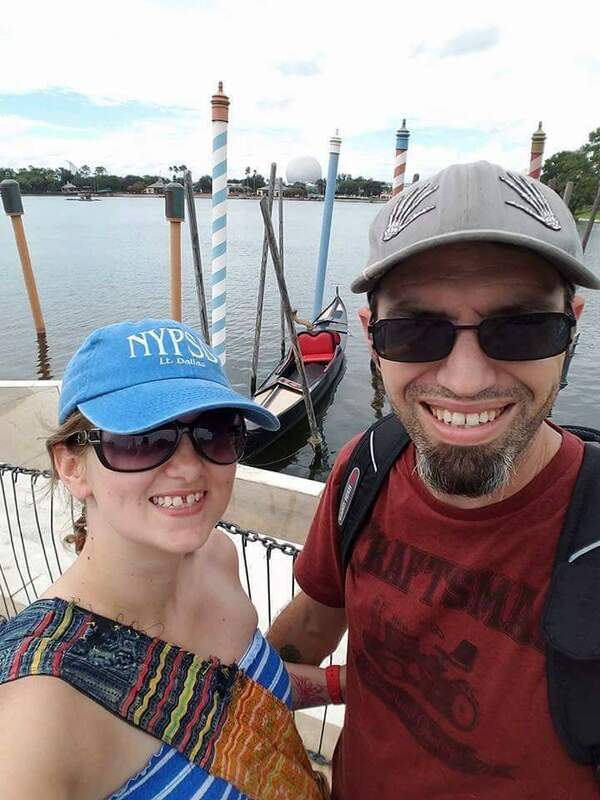 We had our first day at Epcot, which I enjoyed much more than the first year we went. I planned out this trip out to make the most of it. 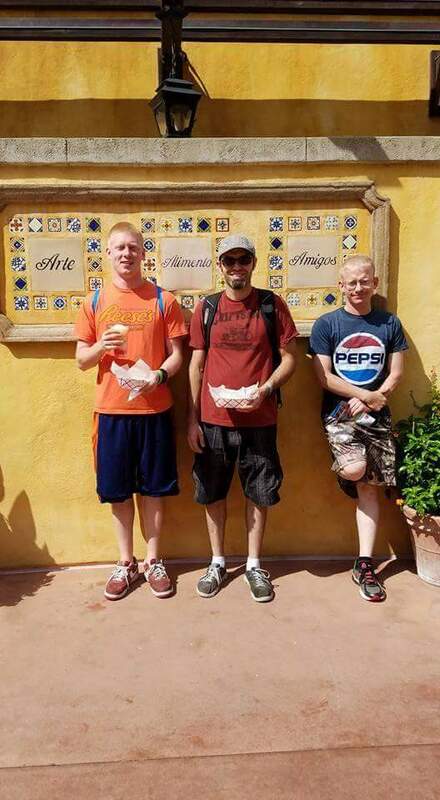 Tony, my brother Josh, my cousin Ben and I were going to drink our way around the world at Epcot. I had read about this on Pinterest and it sounded like a lot of fun. We started in Mexico, where Tony and I shared a Mango Margarita. It wasn’t very good, but it got us started. The churros we got to go with it were very good. I had never had them before, and I thoroughly enjoyed them. 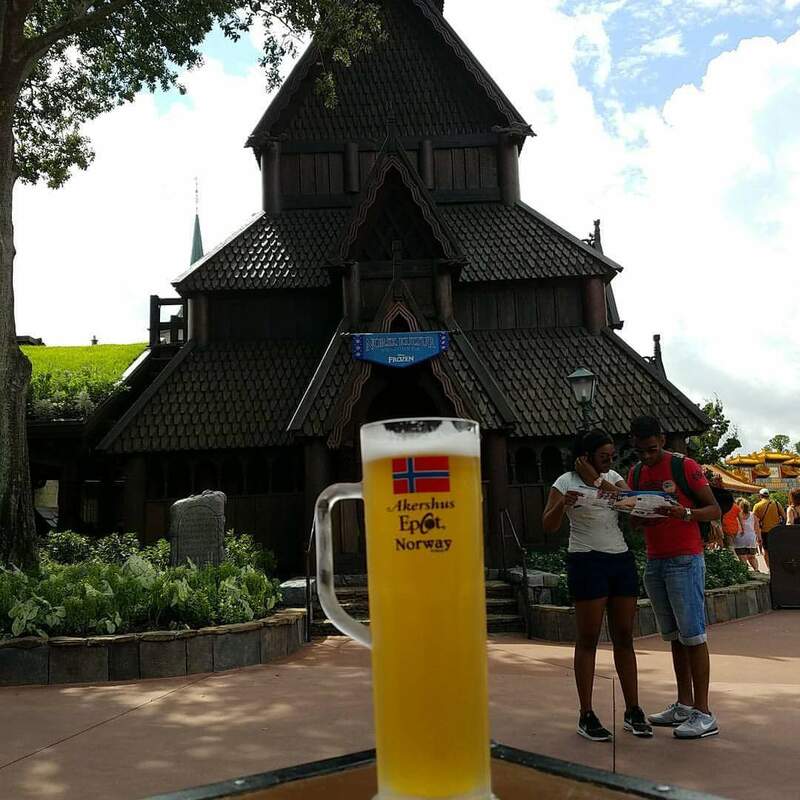 Next stop was Norway, where we had Einstöck White Ale. I’m not a big beer/ale/lager drinker, so I had a few hits out of this souvenir glass. It wasn’t bad, even for a non-ale drinker. On to China! 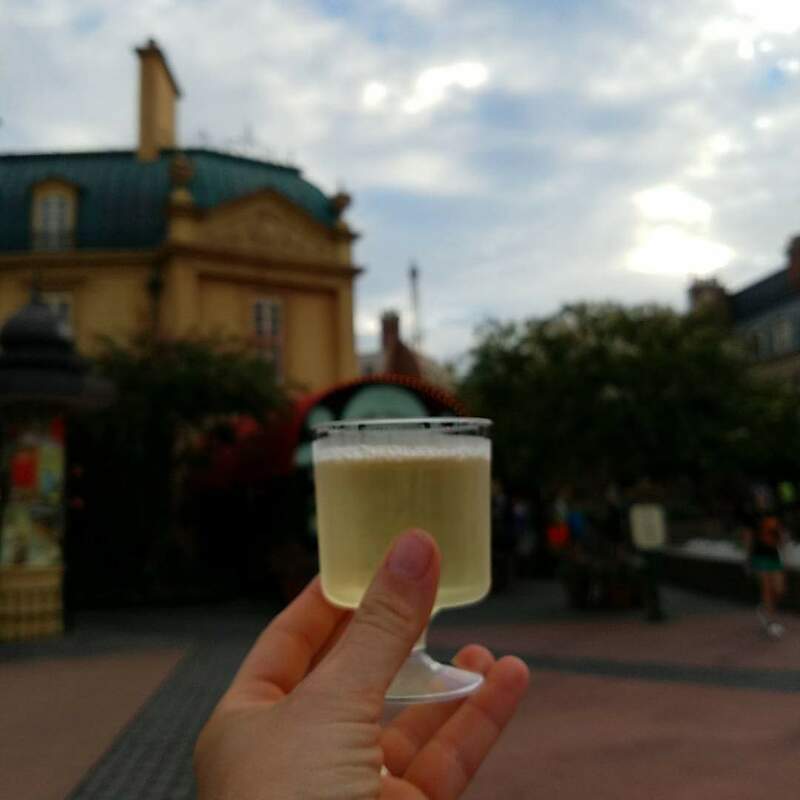 This drink is called Tipsy Ducks in Love. It is a coffee flavored delight! Tony and I both enjoyed this one immensely. We had to stop for lunch in China because my brother, unbeknownst to me, had drank a shot and a full drink in Norway and China and was a little wobbly. No breakfast and the heat, combined with the alcohol, left him reeling. 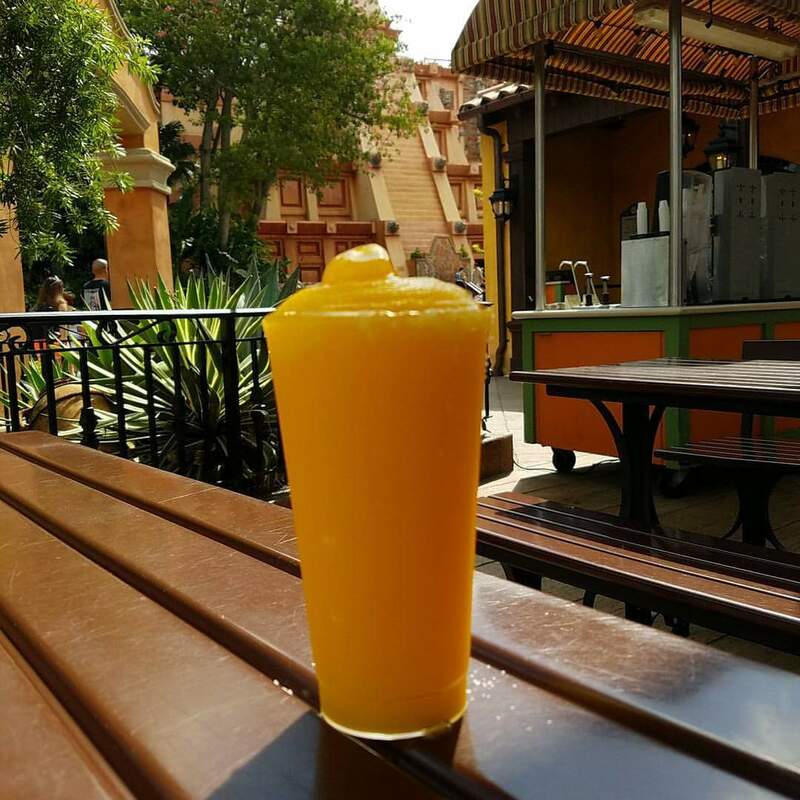 Africa isn’t really a country at Epcot, more of a “trading post”, but we still got a drink. This is a Frozen Elephant, which is their fancy name for a Coke slushy. It was really yummy either way. 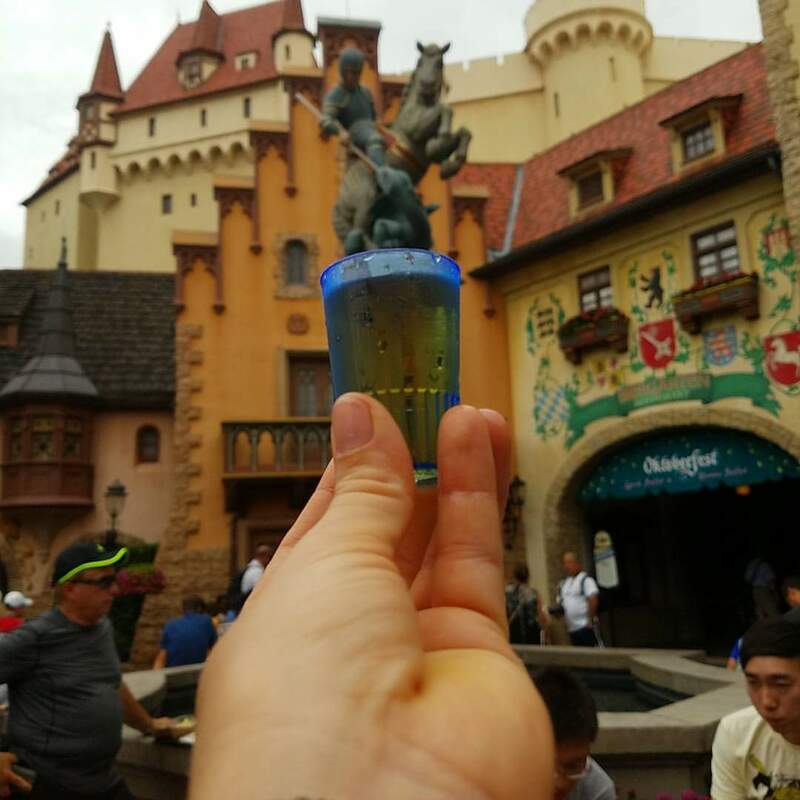 This delightful shot is called a Bärenjäger Honey & Bourbon. You find them in Germany and they are delicious and smooth. I actually stole this from my brother. Didn’t want my baby brother to drink himself sick after all…. 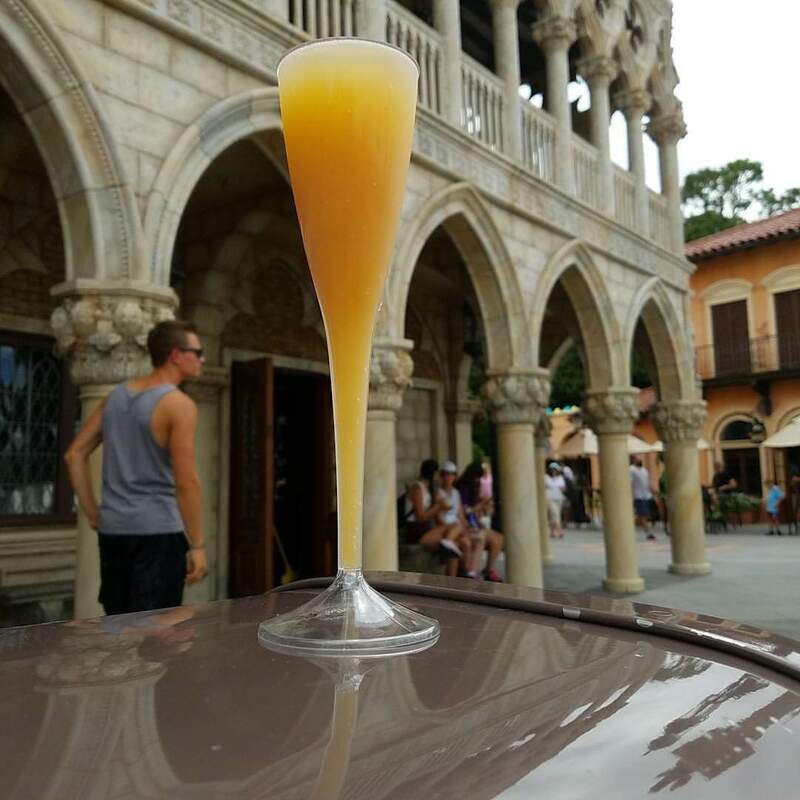 Nothing says Italy like a Bellini! Peach was my choice today. There can never be anything wrong with Bellinis around! Boulder Beer was our choice in America. The boys enjoyed them, with me taking sips to say I did. Just can’t develop the taste buds to enjoy beer, sorry. 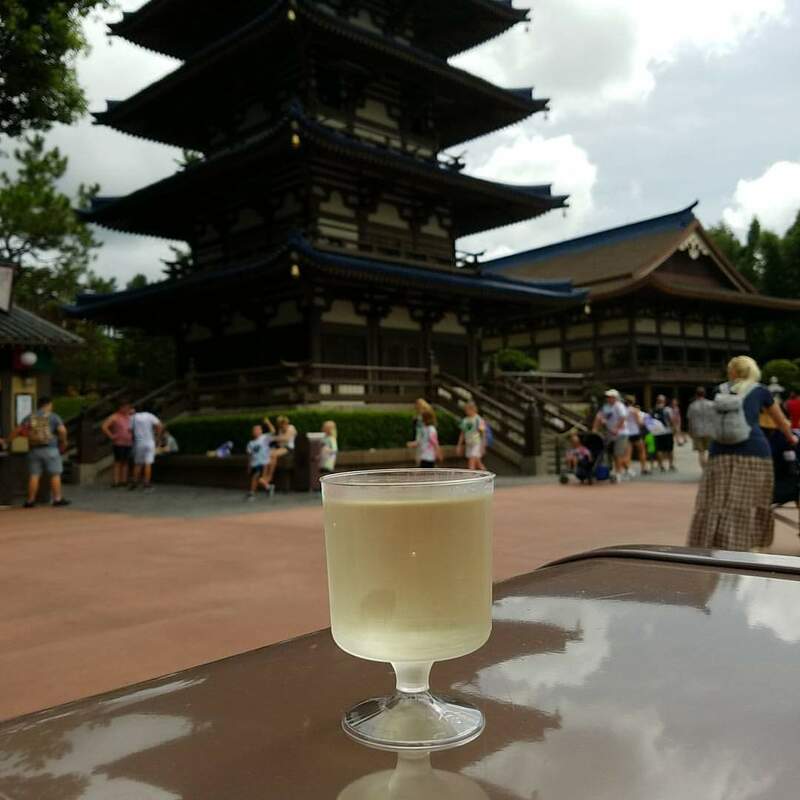 Cold Sake in Japan? Yes, I think I will. My brother enjoyed his, but he also spent two years in the real Japan, drinking this all the time. It hits hard, so if this is your choice, available hot or cold, sip cautiously, you’re a little over halfway done. 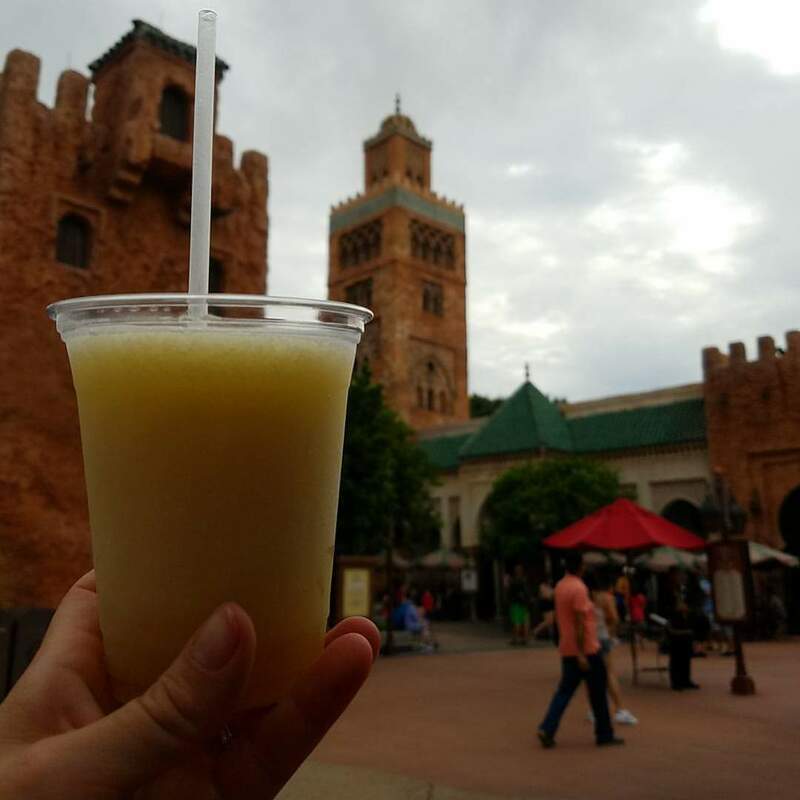 This is a Sultan’s Colada, found in Morocco. It’s a Pina Colada, but I like those, so it was all good. 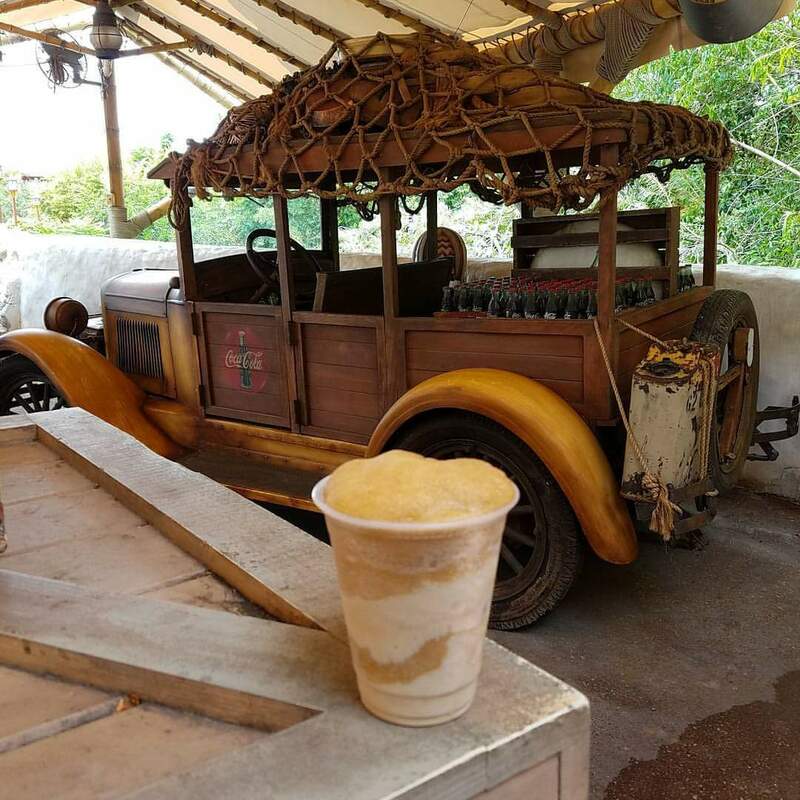 They had a variety of slushy drinks, alcoholic and non, so we enjoyed a variety at this particular stand. We backtracked to Norway for our dinner reservations, then made our way back to France to enjoy some wine. Vouvray Sauvignon was my choice, as it was one of the French vintages available. I love whites, so it was a winner. A little drier than I normally like, but I’m far from a wine buff. This is an English Rose, obviously from the United Kingdom. The boys got their beers and ales, but I went a little fruity. Delightful! 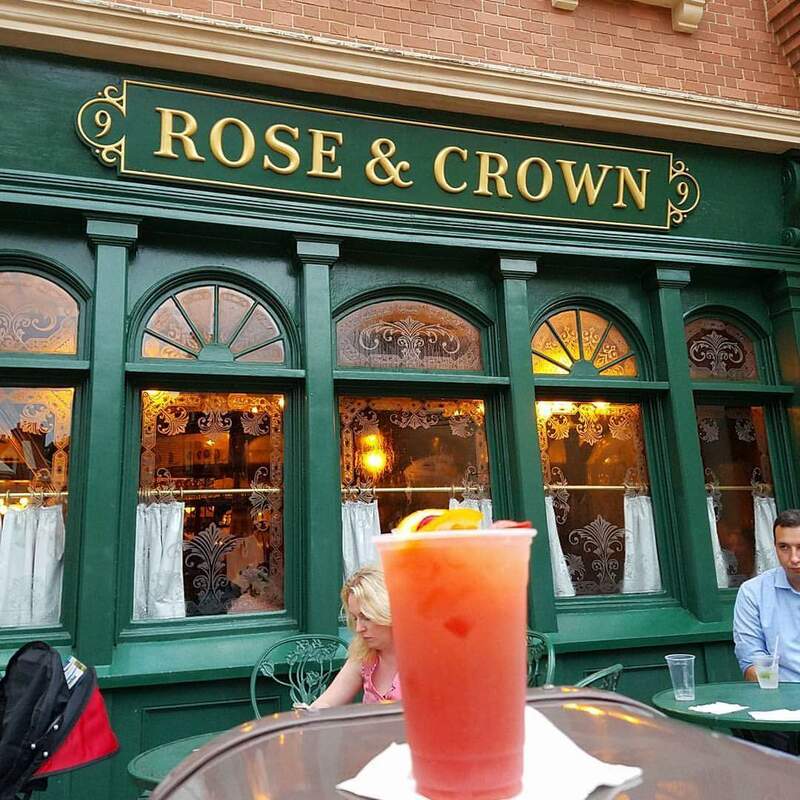 The pub where we got our drinks is exactly how I pictured an English pub, so be sure to stop into the Rose & Crown. Last step was Canada. We barely made it before the light show started, but we managed to get a Labatt’s Blue. Great Canadian Beer, and I have fond memories of it before I was legal, so I managed slightly more than a few sips. In Canada, we ran into these delightful French guys, who actually work at Epcot, in France as I’m sure you’d guess. They were hammered, had amazing accents, and hit it off with my cousin. Their immediate friendship led to them buying shots for Ben, who had done beautifully until then. The rest of the night was spent trying to keep him out of trouble. All that aside, French guys are fun! 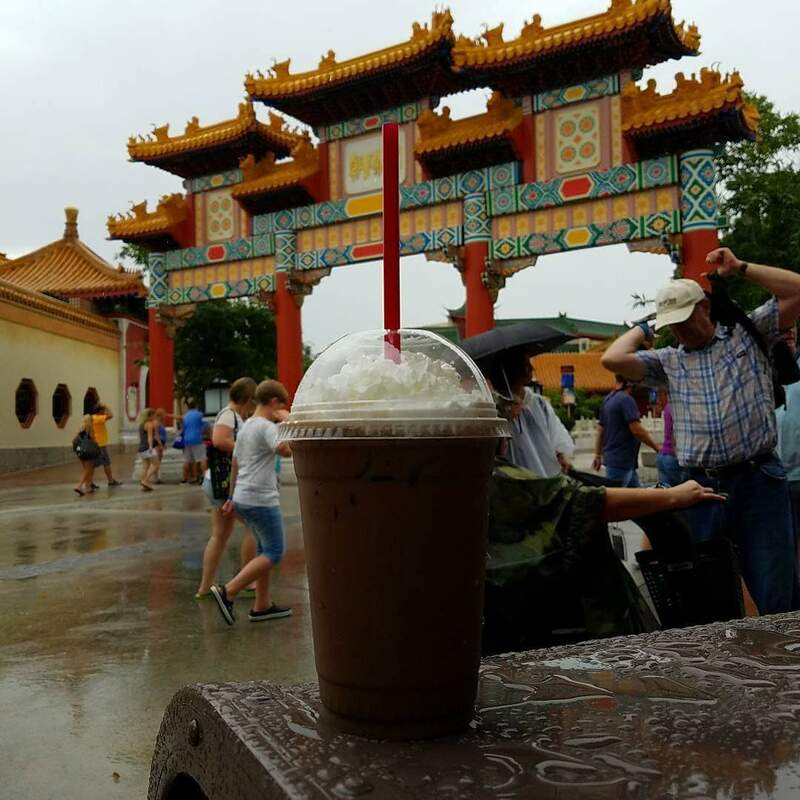 Our trip around Epcot was pricey, but Tony and I offset the cost by sharing drinks. These drinks were mostly purchased at stands you’ll see just walking through. It was a lot of fun and we’re all looking forward to another drinking game on our next trip. Suggestions? Hands down, today was the best (non family) day ever! I have never had a more exciting day in my life that did not involve either my parents, husband or kids. It started at 4:30 this morning, with Tony telling me alarm was going off, and to get up. I woke up my friend Mark and we were on the road by 5am for Boonsboro, MD. 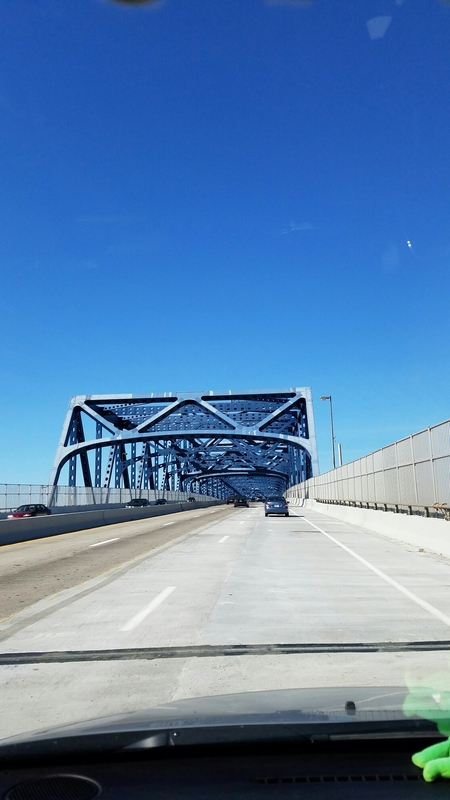 We made amazing time on the way there, although I spent $30 in tolls! Yikes! I purchased the new book, The Obsession and a fabulous hat! Then it was off to wander the streets of Boonsboro. I have been here before, twice in fact, but have never had the opportunity to roam for hours. I walked through a beautiful cemetery while waiting for Mark to get back from a cache, then we went to lunch at Vesta’s. Mark and I split a delicious Warrior’s Pride pizza. 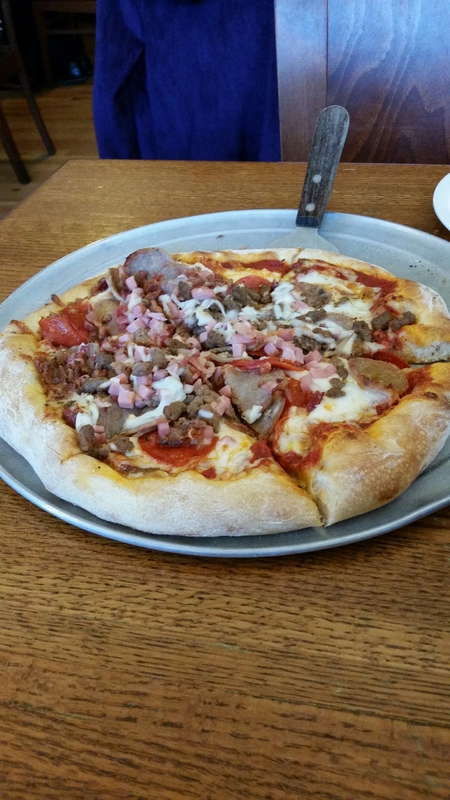 It was Ryder Montgomery’s favorite pizza in the Inn Boonsboro trilogy. We walked around, grabbing a few more caches, ending up at the Museum of History. There is a geocache on the front porch, and while signing it, the proprietor of the museum was coming back from somewhere. Normally the museum is only open on Sundays through the summer, or by appointment, but he offered to show us through the first floor. 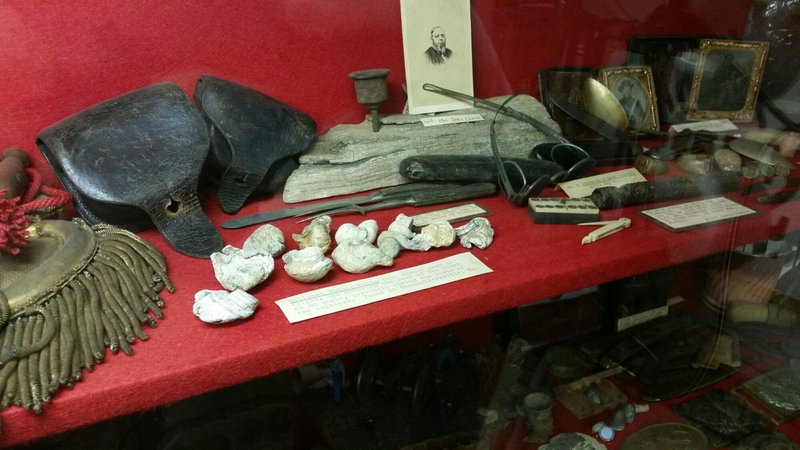 The displays ranged from the expected Civil War memorabilia, such as this bullet cluster. These are formed when bullets collided in midair. 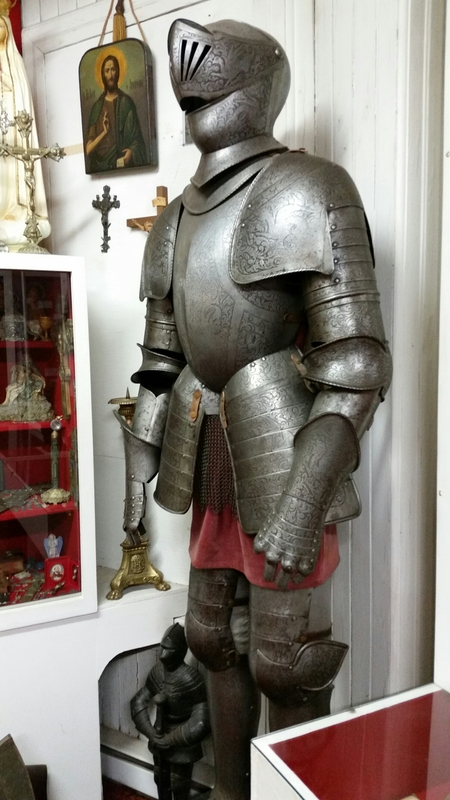 There was also this beautiful suit of parade armor. Then it was back to the bookstore for my signing. 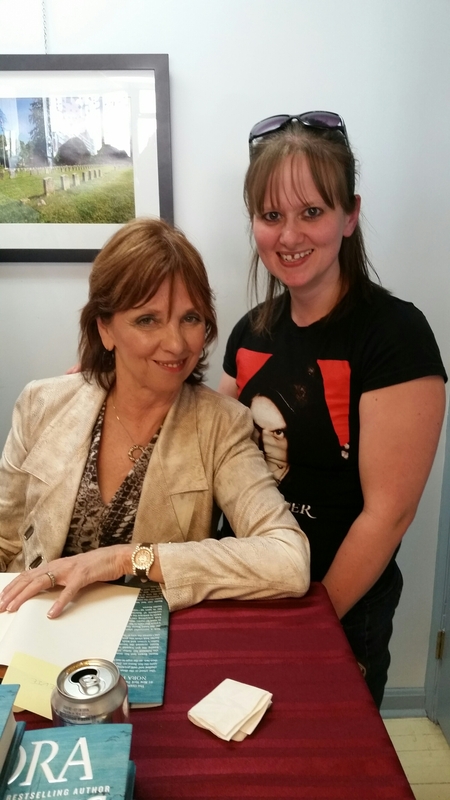 I know have a personalized book, signed by Nora Roberts. How fabulous is this?! She also signed my hat! 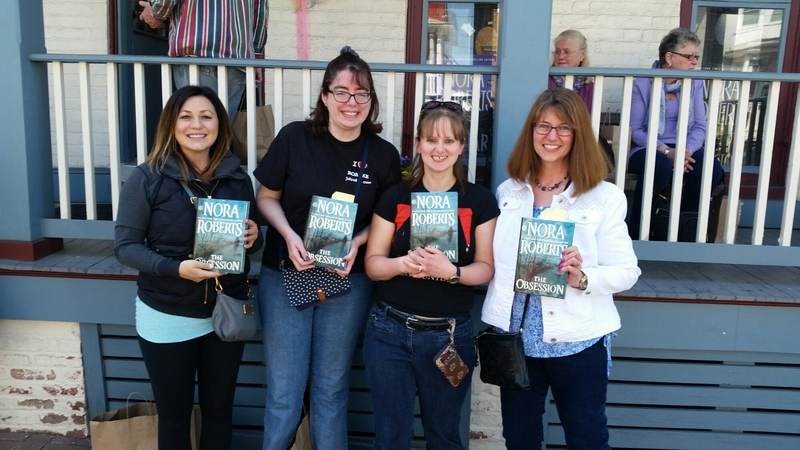 Here we have my new circle of friends, we’re already planning another trip for the release of Bay or Sighs! It’s so wonderful to meet people who love the same things you do. And they really enjoyed watching me fangirl like a crazy person! This was a fun project! I can’t wait to make one for Tony and I, but this particular one was a Christmas gift for my parents. You’re probably wondering, “Wow, Christmas was months ago. What took so long?” I couldn’t figure out how to get this present to them, so they didn’t get it until the kids Spring Break. I couldn’t post about it until they had seen it. So here we go! 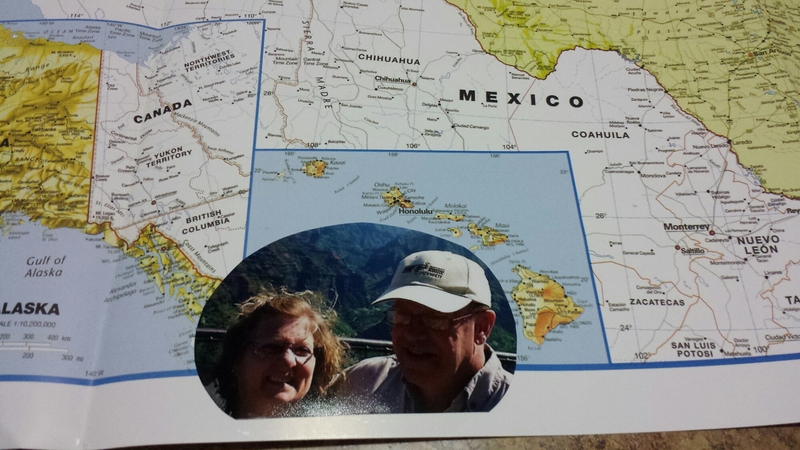 I started with this 24×36″ map from Amazon. I love Amazon! If they don’t have it, it’s not to be had! I went with that size because I wanted to be able to see the pictures when they were all in place. Then the fun started. I had to sift through my pictures, thousands and thousands of pictures, to find pictures of my parents in different states. I wanted pictures with just the two of them, but the Missouri picture included my kids (mom still loved it!). Then the tricky part. 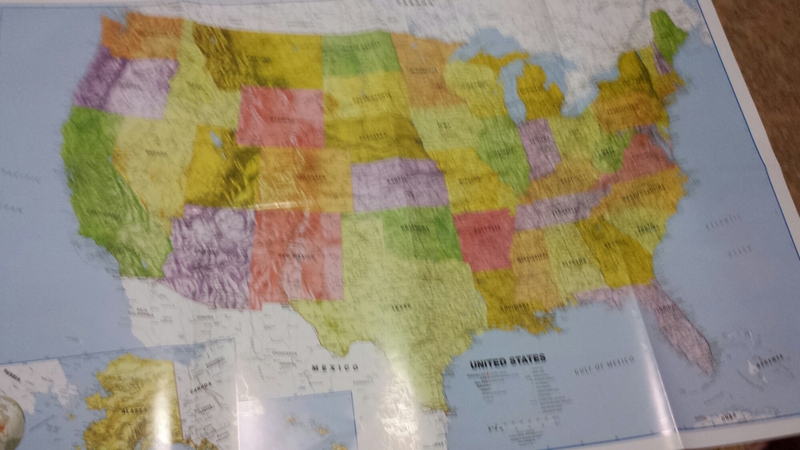 Cutting the pictures into the shape of states. Certain ones are easy, like Ohio. Others, like North and South Carolina can be difficult. Especially considering you have to cut the photo in such a way as both people are still visible. Some states, like Hawaii, there is nothing you can do, so make up your own mind what to do with the special states. I just did a cutout around them and put it by the state. 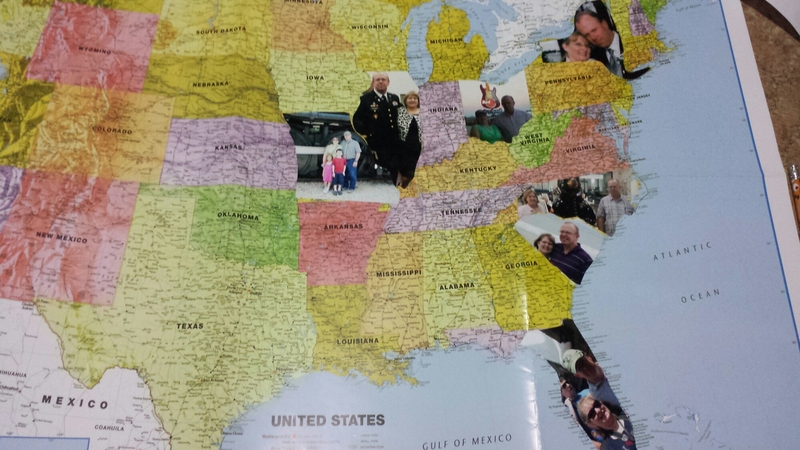 Once I had placed all of the photos I had, I framed the map and considered it complete. There is always the option of adding more photos, I definitely want to add a picture of them from Alaska when I find one! Mom was very happy with the gift. I haven’t heard what dad thinks yet, but I picture a smile, a nod and a “looks good”. Sweet and a little shy about it, just like he’s always been. If you travel, if you take pictures, even if you wanted to do a family map instead of a couple map, this is a fun, and only slightly complicated craft!